If you loved the Terps’ “Maryland Pride” uniforms and wish that you could have one of your very own, then you may be in luck. Due to overwhelming demand, Maryland Athletics will make 10 helmets and 10 jerseys from the Maryland Pride collection, worn Monday by the football team, available for auction. The process opens Friday morning. Bidding will start at $500 for the helmets and $200 for the jerseys. Proceeds will benefit Maryland Athletics. Bidding on the 20 items will end at 3 p.m. on Monday, Sept. 19. The auction page is located here. 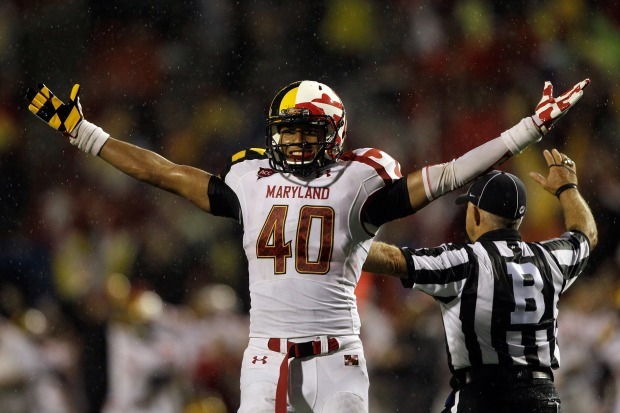 So, what would you do with a Maryland Pride uniform if you were to find yourself in possession of one? Wear it to work for casual Fridays? Try out for the Charm City Rollers? Stuff it and make the most intimidating scarecrow ever? Make your own tablecloth and matching helmet chip bowl? We’d probably make a flag out of it. It would look pretty cool on a sailboat.